The cinematic re-imagining of apocalyptic disaster in the wake of September 11, 2001 has been a messy confusion of realism and spectacle. What was for many Americans a live witnessing of real-life, large-scale catastrophe has found representation in a handful of films working within a genre — the disaster film — that inherently plays on our shock and awe toward scenes of incredible devastation. What’s new in the last five years is not only a recontextualizing of the disaster blockbuster for the post-9/11 landscape — as in War of the Worlds and V for Vendetta’s direct references to contemporary events and politics — but also more unflinching depictions of violence and destruction, which compete for cultural relevance with an event that, as both disaster and image, had rendered such images inadequate. More so than even Steven Spielberg’s War of the Worlds, Alfonso Cuarón’s Children of Men, based on the P.D. James novel, re-imagines (or re-envisions) mass calamity in the most logical, terrifying terms. In the year 2027, the world has fallen into anarchy due to a mysterious medical crisis: Women can longer bear children. With entire civilizations collapsing in the face of imminent extinction, Britain “soldiers on” as a totalitarian, anti-refugee police state. The concept is ripe for taking on the controversies of the Bush administration an its proclaimed unending war against terror. Unlike the cartoonish sloganeering of V for Vendetta, Children of Men is almost too convincing in the loving (if that’s the word) detail that it sketches about where we might be headed. Opening with a double-punch of an announcement about the death of the world’s youngest person (an 18-year-old) and then a terrorist bombing (actually committed by the government, reflecting Cuarón’s understanding of state-sponsored violence), the film portrays both events in a big-budgeted reportage style that deploys aesthetic wow and plunges the viewer into the unpredictable social fray. The ruined London setting — polluted, bombed-out, teeming with protesters, prisoners and outlaws — is where Theo (an appropriately downtrodden Clive Owen) lives as a disillusioned government employee. Called upon for help — i.e., kidnapped and bribed — by ex-wife and underground pro-refugee resistance leader Julian (Julianne Moore), he agrees to help a friend get out of the country. But he is roped into a wildly twisting scheme to transport an actual pregnant woman, Kee (Clare-Hope Ashitey) to an organization known as the Human Project, where her miracle can be studied to save humanity. By placing a MacGuffin of hope into his doomsday scenario, Cuarón invigorates the plot, and we follow Theo and Kee on the run from rebels Luke and Patric (Chiwetel Ejiofor and Charlie Hunnam), who want to exploit her for their cause. More important, he increasingly shoots the film’s set pieces in virtuoso long takes — gliding tracking shots that evoke Tarkovsky and handheld work that suggests Kathryn Bigelow. What makes these scenes stunning is not only mind-boggling choreography and timing, with Emmanuel Lubezki’s camera somehow capturing multiple planes of action even while continuously changing position, but also their ability to realistically evoke the frightening chaos and simultaneous madness of war. In the grand finale, set amidst a refugee camp uprising, main characters suffer deaths just like the extras around them, and blood that’s spurt onto the camera lens is never wiped clean. Such overwhelming studio work might be too arty for those who like their genre served sans showiness. But Cuarón is implementing a verisimilitude that both matches the film’s edge-of-your-seat escalations and demonstrates a new understanding of blockbuster realism. One also latches onto the deftly orchestrated mayhem because Cuarón nearly sabotages his own film. 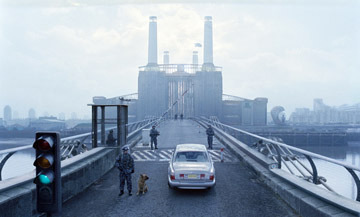 He uses an entire scene to pointlessly recreate the cover of Pink Floyd’s Animals; fashions the film’s few good guys as insufferable back-to-nature neo-hippies (thankfully, non-collective ones); dabbles unsuccessfully in Holocaust and Abu Ghraib imagery; and relieves the mounting dread with insipid generic humor (a twice-told pull-my-finger gag from Michael Caine’s wacky activist; Theo ironically sighing “What a day!” after their hellish journey through a liquidated ghetto). Blunt religious metaphors also complicate appreciation of what might have been an exercise in pure but not gratuitous cinema. From the deepest nightmares of eschatological fear to up-and-at-’em optimism, Hollywood filmmaking can always be relied on for a dose of escapist messianism, whether in the form of a deus ex machina (War of the Worlds), the Chosen One (The Matrix series) or patriotic heroism (anything Bruckheimer). Cuarón makes explicit the religious slant of this contrivance. He tries to neutralize it, when Kee merely jokes that her baby is fatherless, but Christ symbolism (as well as Theo’s paternal redemption) can’t be helped when the child is literally mankind’s savior. With such a central, often bombastic element, Cuarón comes close to shaking Children of Men off its brutally realist foundation. One moment, however, proves his avoidance of simplicity, and his adherence to grounded spectacle. Having evaded Luke’s clutches and death by indiscriminate gunfire, Theo, Kee and her yet-to-be-named baby exit a bombed-out tenement building under siege by the military. As they move past refugees, rebels and soldiers, they leave each person in silent reverence of the marvel that is unfolding. Part of an even longer long take, the shot follows the three down a stairwell and out a door to the promise of the Human Project. The stunned crowd, just seconds earlier in the throes of all-out war, seems to have set aside chaos for a common cause — the future of the human race. Then an errant shot fires, and the fighting starts all over again.